Training employees is part of running a business. E-learning offers a range of benefits to your training initiatives, plus it is suitable for a range of training topics and courses. This includes everything from sales training to compliance training to on-boarding new employees. 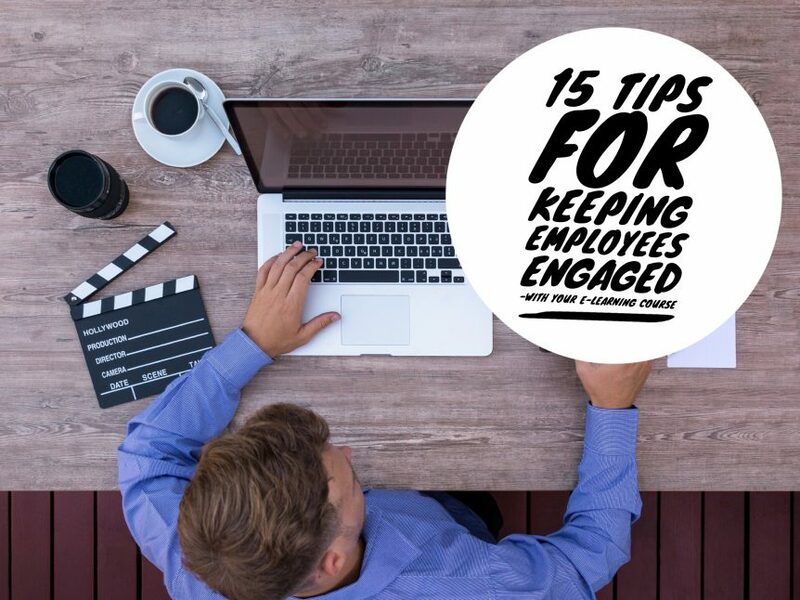 As with all training, however, the key to success is keeping employees engaged. It takes careful planning and focused development, but it is possible to increase engagement rates. Here are our 15 tips. While this list is not in any particular order of importance, this is arguably the tip that will deliver the most benefits. Personalising the content of your course ensures you pitch it at the right level, plus it helps employees relate to what they are learning with their everyday experiences. This could be, for example, ensuring Dubai-based employees get content that is relevant to them rather than content relevant to an office you have in another part of the world. When learners know what to expect, they will be more likely to stick with it. So, explain what the course entails, how long it should take, and the objectives you want to achieve. If appropriate, you should also outline your expectations of the learner. Make sure you also take time to explain to employees why the training is important to them. This is often harder than explaining why the training is important to your business, but it is a crucial part of the process. When employees understand the real-world benefits to them, they will be much more likely to engage. Clutter distracts, confuses, and annoys learners, so remove everything that doesn’t directly contribute to or facilitate the training. You can’t be sure that everyone on your team will understand jargon terms and phrases, so you should always be careful using them. This particularly applies when new employees will go through the training or people from different departments who might use different terms. There is sometimes a tendency when creating e-learning courses to overly formalise written and spoken content. This is not necessary and can actually negatively impact engagement. Your content should, instead, use normal language. Often, a conversational tone is best. This means removing large junks of text and replacing it with short paragraphs, short sentences, lists, and sections. Content presented like this is less daunting to read. Examples are an important learning tool. They work best, however, when your employees find them interesting and relevant. Quizzes help employees engage with e-learning courses for several reasons. Firstly, quizzes create active and participatory elements in your e-learning course. Also, quizzes let employees know what they have and haven’t understood. Overloading employees with information during training courses rarely works. Our brains are simply not set up to learn in this way. Instead, you should present information to learners in small, easy to get through, and easy to understand chunks. Using a variety of different media helps too. After all, page after page of text will start to get boring, however well it is written. So, you should include images, videos, infographics, animations, gamification elements, and audio in your e-learning courses. Scenarios are another way you can get employees actively involved in the course. In addition, scenarios help you personalise the content of your course, plus they are an effective learning tool. Scenarios are like role-playing exercises, although employees complete them digitally. They are a great way of adding collaboration exercises to your e-learning courses. Storytelling, rather than presenting facts and theories, helps employees visualise and understand the information you give them. It also makes the content more interesting, helping to keep learners engaged. Offering regular feedback can also help. This could be words of encouragement or it could be tips or advice on what to do next. An example of the latter is advice on further reading that will help the employee improve or refine their skills. Feedback also helps employees see the progress they are making and where they need to undertake further work to improve. Finally, an unprofessionally designed, poor quality, and/or difficult to use course will quickly turn off employees, cause them to disengage. Therefore, make sure your course is as good as possible. Often this means using professional e-learning developers with extensive experience in the industry. Keeping employees engaged with e-learning courses requires good communication, good course structure, and interesting, easy to consume content. You will need to invest to achieve this, but you will see improved results that will deliver a better return on investment when you do.